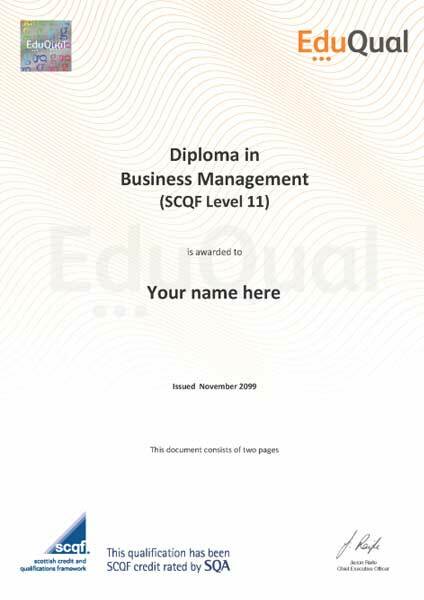 The Diploma in Business Management (SCQF Level 11) is a 120 credit size qualification with 5 compulsory units and is a Regulated Qualifications Framework (RQF) equivalent Level 7 qualification. This Diploma in Business Management is a Regulated Qualification, equivalent Level 7 qualification. It is designed to meet the needs of senior/middle managers in the running of their businesses, and to facilitate their progression to higher levels within their organisation. Managers need to be aware of issues, able to analyse their potential outcomes and consequences, and decide how to react. They do not have to be expert in all areas of business but they need to possess a general awareness of what specialist facilities and services exist, and how they can assist in carrying out that role. The programme includes contemporary topics reflecting key issues within the 21st century business environment, as well as the latest developments in management research. As this qualification is approved and regulated learners are eligible for progression / Top Up to MBA degree. LSIB offers learners opportunity to avail MBA degree on completion of this diploma qualification in just six months, at a special price of £4500.